A Crafty B’s Craft Fair? Yes please! I can’t believe I am actually embarking on the organisation of a crafts fair. It will take place on Saturday 8th September 2012 at Bourn Golf and Leisure in Bourn, Cambridgeshire. The fair is being held to raise money for the Rosie Hospital Campaign. I am so excited not only to be organising such an event but also to be raising money for such a great cause. 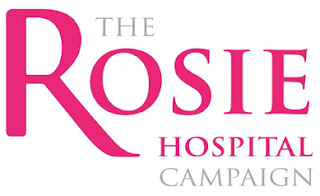 The Rosie Hospital Campaign is close to the heart of many local people including myself. This is reflected in the willingness of many local business to be involved and assist in raising as much of a contribution as possible. Baby B was born at the Rosie last year and I know that the extension of the hospital and its services to accommodate more women, could only ever be a positive thing. You can find out more about the the Rosie Hospital Campaign here. The location of the fair is also close to my heart. Bourn Golf and Leisure was where Hubby B and I spent our wedding day last year in a wonderful marquee setting, having a sit down meal with all of our friends and family. The most perfect day made even better by the staff at the gold club! I couldn’t think of a better place to have a community event! In terms of the Crafts Fair itself, it is intended to be a community event in all aspects. It will be a fair with a difference. If you are a crafter, or want to start a new hobby, come down and join the Crafty B’s Craft Group for a bit of crafting on the day! So what can you do with this info? If you want to book a stall, get in touch! If you want to visit the fair or make a contribution to the event in some way, join me on Facebook to keep updated on all of the info and ways in which you can help. To make a contribution visit my Just Giving Page. I hope that you can all join me in one way or another and as always, it would be great to hear from you. Please feel free to email me or find me on Facebook or Twitter.